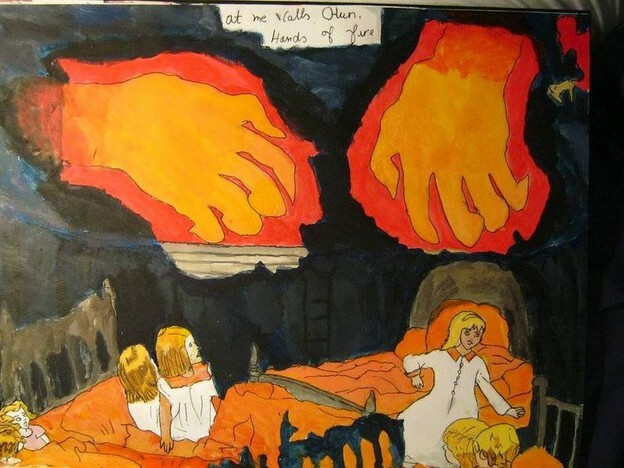 If we push the uncritical romantic views of the outsider artist aside, it’s difficult not to read Henry Darger’s In the Realms of the Unreal as embodying the dynamics of an abuse narrative. His epic uses multiple mediums: newspaper clippings, stenciled drawings, watercolor paintings, and narrative fiction to depict a child slave rebellion against their Glandelinian overlords. The heroines of Darger’s allegory of Christian martyrdom are the Vivian girls, rendered by the author in a range of disturbing, one-dimensional fashions: the girls are shown, by turns, adventuring through idyllic, Edwardian landscapes, and falling prey to the grotesqueries of absolute violence, hanged in a field or strangled. Notable is that Darger often draws male genitalia on the little girls, a fact overlooked by many as mere curiosity. John Ashbery encountered Darger’s work in the 1990s and this encounter inspired the corresponding long poem, Girls on the Run. In Darger’s simplistic world, the girls are unquestionably moral and good and the author gives them no room to deviate from their characterization, which feels particularly misogynistic. LISTEN TO THE SHOW Joan Retallack states, “the Vivian girls are nothing if not good sports as they accomplish their missions with earnest athleticism,” but how would we know? Their role in the social is fixed in Darger’s newsreel-like obsession; their purpose is to fight their masters as well as to suffer violence at their master’s hands, at their author’s whim, devoid of authentic feeling or interiority. I chose to write about Girls on the Run because, for one, there appears to be a lack of polemical scholarship on the book and when I asked a few literature scholars about it, they seemed to agree that the book is particularly difficult. What I would like to argue in this talk is that Ashbery’s book is about the affective, textual, emotional, and psychological frames of childhood. Feelings of instability, indeterminacy, and flux, which are often linked to John Ashbery’s poetic oeuvre, are heightened within this framework because childhood is a time of growth and development, where the mind itself is neither fixed nor certain. I would like to further claim that Ashbery’s unique use of texts associated with childhood provides templates for his characters to learn how to feel and react, to play games, and test out ideas against such uncertainty. Lastly, though Ashbery is not often regarded as a directly political poet, this book helps us to understand a textual system of thought in its more nascent, chaotic state, one that points to a larger field of social and political terror solidified outside of the text. Normative emotional codes, the etymology of feeling, are constructed in the child’s early encounters with not only family (and other more obvious forms of the social) but also in texts. For Ashbery, the importance of comic strips, cartoons, and children’s books is well-documented. In a 1980 interview, reprinted recently in the Bennington Review, Ashbery comments, “cartoon characters appear in quite a lot of my poems and, of course, my first literary experience was comic strips. In a way, it may have been my strongest one.” What’s surprising about Girls on the Run is that emotional states are elicited through what we would normally think of as the constraining structures of mass culture, the clichéd language of feeling lifted straight from comic books. However, in Ashbery this language to some degree liberates the characters to explore, freely associate, and develop in their world. “Let’s get out of here,” Judy said. “Now that’s funny, he was here just a moment ago. At the core of this array of quotations, its various voices and registers, lies the interplay of rule-making and rule-breaking, pointing to the social order through the use of our culture’s recycled language of feeling. The ominous threat here as well as elsewhere in Girls on the Run is the internalization of ideology itself. It cannot be escaped. the lovers and the learners side by side with the vexed and disinherited. but we must learn to read, “and that ain’t easy,” Trevor summarized. tomorrow will be another day, and different. and we all unable to do anything about it, in case it ever does. So we appeal to you, sun, on this broad day. You were ever a helpmate in times of great churning, and fatigue. But the climate is military, and yet one can’t see too far ahead. The children who long for a “more regulated environment” now turn to the sun for a potential source of order. But this structural option dissolves quickly because the “climate is military” and “one can’t see too far ahead.” Thus, the characters are cut off as if by smoke on a battlefield. When it was all over, a sheep emerged from inside the house. Festive, eternal, misconstrued. Does anyone still want to play? The children cheer the surreal moment of the sheep that emerge “from inside the house,” but they also recognize that “these are lousy times to be living in,” which reiterates the sense that the larger social order outside of the text is one created through militancy and terror. I interpret this passage as alluding to the American military-industrial complex. In a moment of reflexive understanding, the children see themselves as they are: they “are the case” and they will be the case “seven times seven ages later” when they become adults. Their social order and the social order outside childhood appear to collapse at this moment in the recognition of what they will become, part of the larger social order, the adult world, “the times” which are “festive, eternal,” and “misconstrued.” Centering the complexity of play, growth, and development, not to mention the social order, is the provocative question: “Does anyone still want to play?” One can imagine a child saying this to his or her friends after all the kids want to stop playing and everyone is tired. The line can also be read as a child who tries to get his or her friends to begin to play. Finally, it can be read as Ashbery himself, with an adult understanding of the difficulty and challenges of play, after knowing what he knows about the militant world asking does “anyone still want to play?” which suggests the weariness and disheartening nature of growing into and becoming part of the “misconstrued” matrix of the larger social body. until it seemed none of us could be a worker or a welfare recipient. Melinda strums a thighbone guitar, the rest are off in the distance. but it was too late to use it. In 1996, Bill Clinton signed the Personal Responsibility and Work Opportunity Act. For the first time since the 1930s, the poor would be cut off from public assistance if they did not find work, effectively transferring wealth from the public sector to the corporate. This wealth transfer was fueled by a politics of racism and sexism. It’s unsurprising that in this world of narrowing options, being a worker is just as impossible as being a welfare recipient. This has to be read within the greater political context of neoliberalism in the 1990s. Enjoyment is relegated to a dash of salt. Jammed into the passage appears to be a list of side effects from medication. These are the side effects of living in a capitalist system where people are replaceable. If the “tall buildings” are taken to be the fortresses of American capital, walling ordinary Americans out from prosperity, then it makes sense that “unsealing the tips” could be a possible avenue of liberation. These symbols of capitalist wealth, naturalized with their environment, “sway to and fro, / in time with the maker’s rhythm” as if the buildings are continuous with nature and god. 1. Joan Retallack, “Tragi-Kitsch & Elegiac-Comix: Girls on the Run (1999),” Conjunctions, no. 49 (2007): 404. 2. John Ashbery, “Interview: Conducted by David Remnick,” Bennington Review 4 (Fall/Winter 2017): 89. 3. John Ashbery, Girls on the Run (New York: Farrar, Strauss and Giroux, 1999), 64. 4. Lauren Berlant, Cruel Optimism (Durham: Duke University Press, 2011), 31. 14. John Ashbery, “What is Poetry,” Houseboat Days (New York: Viking Press, 1977), 47. 15. Ashbery, Houseboat Days, 21. 16. Christopher Nealon, “John Ashbery’s Optional Apocalypse,” The Matter of Capital: Poetry and Crisis in the American Century (Cambridge, MA: Harvard University Press, 2011), 73–106. See also Roger Gilbert’s essay “Ludic Eloquence,” which highlights the presence of “local moments of intense affect” in Girls on the Run, and marks a “shifting calibration between modes” of saying and playing throughout Ashbery’s later works. 17. Ashbery, Girls on the Run, 15. 18. Ashbery, Girls on the Run, 72. Marxist-Feminist Dispaches from Florida: Over the next few months as guest commentator here at Jacket2, I will be writing about contemporary American poetry with a particular focus on the intersection of capitalism, feminism, and poetics. 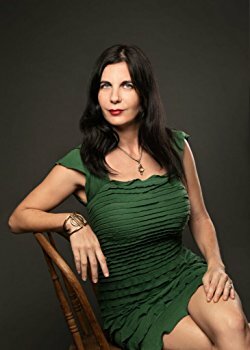 Sandra Simonds is the author of six books of poetry: Orlando (Wave Books, forthcoming in 2018), Further Problems with Pleasure, winner of the 2015 Akron Poetry Prize from the University of Akron Press, Steal It Back (Saturnalia Books, 2015), The Sonnets (Bloof Books, 2014), Mother Was a Tragic Girl (Cleveland State University Poetry Center, 2012), and Warsaw Bikini (Bloof Books, 2009). Her poems have been published in The New York Times, Best American Poetry 2015 and 2014, and have appeared in many literary journals, including Poetry, The American Poetry Review, The Chicago Review, Granta, Boston Review, Ploughshares, Fence, Court Green, and Lana Turner. In 2013, she won a Readers’ Choice Award for her sonnet “Red Wand,” which was published on Poets.org, the Academy of American Poets website. She lives in Tallahassee, Florida and is an associate professor of English and Humanities at Thomas University in Thomasville, Georgia.